A long time back, years ago, I read somewhere that one of Alaska’s requirements to serve jury duty was that a person had to be a Responsible Citizen. Just like that, too: Capital R, Capital C. The trick to being a Responsible Citizen was that, among other things, you had to be a registered voter. Since discovering that lovely little loophole, I’ve used it as an excuse not to vote. 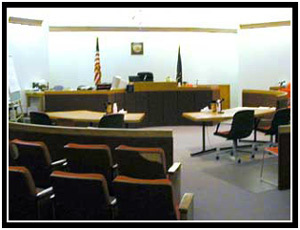 Not that it always works – invariably someone always tells me that the Alaska courts obtain the eligible jury list from the Permanent Fund. Yes, I always say, that’s the “among other things” part. Then I’d go on to state what little proof I had: I’ve never been called for jury duty. The most recent time I’ve had this conversation was with my mom just this summer. She was so convinced that the Permanent Fund is the only source that she was ready to fire up the internet to prove it. I was ready to do the same. We both got online and tried to prove our respective cases… and turned up a whole lot of nothing. At any rate, it’s time to eat some crow. I was wrong. In mid-August I got my first jury summons. Oh, well. It’s time to admit that even us Irresponsible Citizens have to do their civic duty. But wait! The night before my first day of service (servitude? ), I jumped on the internet to make sure I knew exactly where to go. Lo and behold, what do I find, but the exact regulation I was looking for before! What’s the deal? According to this FAQ, I shouldn’t have been called! Unfortunately, I don’t think I could site that web site as grounds for why I should be able to skip jury duty. Especially since all the local media is abuzz about how one of the judges is exasperated with the low jury turnout and has issued Trooper-delivered subpoenas to 83 people. Those irresponsible Responsible Citizens now have court dates where they must give damn good reasons why they shouldn’t be held in contempt. If they don’t show, arrest warrants follow. Great. Now if I forget my nightly call to the duty hotline, I could actually go to jail. Wonderful way to start off my first month ever of jury duty! Last night I checked the jury duty hotline and learned that both groups 1 and 2 are to report to the Dimond Courthouse this morning at 8am. I’m in group 2. Here it is the very first day of the month and I’ve already been called in. Since it takes at least half an hour longer to get to the courthouse than it does for me to traverse the 1/2 mile to work, I knew that I’d have to leave the house earlier. I set the alarm for 6am and went to bed a little early, but I didn’t get a good night’s sleep. Just like during those long days of Tetris, I had anxiety dreams all night about how complicated jury duty would be. By the time 6am rolled around, I was happy to get out of bed just to lower my stress levels! The brief instructions I received in the mail made it clear that jury duty is an Important Thing and they specifically stated that I should wear nice clothes. So, the night before I got out a button-down shirt, pleated pants, a colorful belt, and some square brown shoes. You might not know it, but I clean up fairly well. I left the house at 7am – fully an hour before I needed to be there. I haven’t driven downtown during rush hour for years, so I was a little leery of how much of my time the traffic would sap away. Plus, I was supposed to park at the Coast Guard base, a fair walk from the courthouse. I ended up getting downtown with plenty of time to spare, though, so I just hung out in my Jeep and listened to the early morning news on the radio until about a quarter ‘til. I got to the courthouse with plenty of time to spare, despite being momentarily delayed by the metal detector and X-ray machine at the building’s entrance. When I reached the third floor, there were already a couple people waiting in front of a locked door. The three of us only waited a few minutes before someone came by and ushered us in. I had barely enough time to grab a National Geographic and start flipping through it before the same person handed out a short, 1-page form for us to fill out. In the beginning it asked the typical questions, name, address, etc. It wasn’t until I got to the bottom of the page that I knew for certain that the day wasn’t going be devoted only to orientation. The last question asked us to circle any people we knew in a list that included a defendant, a prosecuting and defending attorney, a police officer, and a smattering of witnesses. It was obvious that there was going to be a trial today. As 8am came and went, more people began to trickle in. I picked up the National Geographic again and browsed through an interesting pictorial of NASA astronauts’ photographs taken from the Space Shuttle and the International Space Station over the years. Between page turns, I sneaked peeks at my fellow jury members. The first thing I noticed was that I was way overdressed. The majority of people were wearing jeans and one or two could even be spotted in Tevas. It’s Juneau, I guess, so no big deal, but I’m not used to being one of the better dressed people in the room. Most of the people there looked normal; by that, I mean working people like me. There were a few that were obviously retired, but otherwise only two others really stood out: A young woman who had brought two young children with her and an elderly gentleman who walked with a cane and needed the clerk to fill out his form for him. Eventually there were over 30 people in the room and I found myself waiting for them to finish filling out the questionnaire. I left the NASA pictorial behind and began reading an article on Gibraltar by Bill Bryson. Just when I was warming up to the idea of visiting there one day (Less than 2 pages in – Bill Bryson could get you fired up to visit a toxic waste dump) the clerk came back in with a video tape. Before we got down to business, she gave us a small lecture on what to do and what to expect if we were selected for jury duty today. Go to the bathroom now, turn off your cell phone, and don’t read in the courtroom; those kinds of things. She answered a few questions while struggling to find the video input controls on the big screen TV. (“How much will we get paid?” was what everyone wanted to know. $5 to show up, $12.50 for a half day, and $25 for a full day.) When she finally solved the TV/VCR quandary, she left us to watch a 25-minute video on the importance of serving on a jury in these wonderful United States of ours. At first, I thought it was a great idea – spare us a boring lecture and let the magic talking box tell us what to expect for the day. Unfortunately, the video was created by ABC and felt more like an After School Special than a guide to serving on a Juneau jury. It was obvious that it was created to combat ignorance; anyone that paid attention in high school (or that has seen more than one episode of Law and Order) knows what they were trying to convey. I resolved myself to looking out the window and again watching the rest of the potential jury members. Half-way through, I did get something from the video, though. Something one of the unconvincing actors said stuck: “If you’re a defendant, having a jury of your peers is your right as an American citizen. But serving on a jury is not a right – it’s a duty.” When I heard that, it got me thinking how I’d feel if I were convicted of a crime (wrongly, of course!) I would want the jury selected for my case to be attentive, intelligent, and respectful of the process. From that point on, I decided to take the process more seriously. Now that I was well-dressed Mr. Attentive, I began to feel sorry for that day’s defendant. While the video played, I spotted at least two people nodding off. One woman rocked her head back and woke herself up when a loud, throat-gurgling snore caught in her throat. Twice. Of course, it distracted everyone in the room and made the little kids start giggling. Others, much like the old me, were no doubt biding their time watching the world outside the window. After the video’s melodrama came to an end, the court clerk once again gave a little speech on the upcoming procedure. She had some extra time as things were still being arranged in the courtroom. I used the opportunity for a quick bathroom break and when I returned, we were ready to be ushered downstairs and into Courtroom B. The room was rather small and the potential jury members almost completely filled every available public seat. The defendant was already seated with her lawyer and sitting opposite them were, I presume, the two prosecutors. While the clerk waited patiently for us to file in and find a seat, the defendant’s attorney swiveled around and began assessing us. I made eye contact with him a couple times and was unsettled. Bug on a microscope slide – would I make the cut? Once everyone was seated the clerk announced what I thought to be something rather non sequitur: Traffic court was down the hall. Apparently the comment wasn’t superfluous – a young guy with a skater’s T-shirt sheepishly rose and left the room. When he was safely on his way to contesting a ticket or whatever else they do in traffic court, our little session finally got under way. When she was finished, she got up and disappeared behind a partition behind the judge’s bench. While we sat patiently, awaiting her return, the prosecutors continued to speak quietly among themselves while the defendant’s attorney continued his survey of potential jurors. At one point I consciously decided to hold his gaze – would that increase or decrease my chances of being selected? Soon after, the clerk stepped back into the room and announced something I’d only ever heard on TV: “This court is now in session. Please rise for the Honorable Judge So-and-So.” At that point, the judge walked in and told us to be seated. I immediately felt more at ease by the way he didn’t appear to put much stock into the formalities. Before he began the official proceedings, he had a few words with us, the potential jury members. He was impressed with the turnout for the morning, somewhere around 80%. He corroborated what the newspapers had been saying, namely that Juneau has consistently had the worst jury turnouts in the state of Alaska over the last 20 years or so. He seemed to think that the actual numbers were likely mistaken by the press – 60% turnout, rather than 40% — but otherwise agreed that there should be no reason for such abysmal participation in what is essentially everyone’s legal responsibility. At that point, he went on to discuss some of the specifics of how our month of jury duty would progress. Even if we’re dismissed today, we still needed to call in every evening after 4pm. Jury trials are rather infrequent in Juneau, but they seem to run in spurts – and it was looking like September could be one of the busy months. He also noted that trails almost always begin early in the week, although just two weeks ago they had one begin on a Friday. On a Friday that just so happened to kick off the Salmon Derby. I’m just speculating, but it sounded like they might not even have had enough jury members to begin the selection process that day and the judge (not ours) hit the roof. He’s the one that ordered that subpoenas be delivered by State Troopers to every absent person. I can see his side, too. Someone was being denied their right to a speedy trial because the citizens of Juneau thought it would be a better idea to go fishing. If I was the defendant in that trial, I’d be asking my lawyer about a mistrial. At any rate, the scare tactics must have worked – at least on those of us selected for the September trials. The judge told us that they typically only needed 3 times the number of jury members to get through the selection process. Today’s trial only needed 6 members; thus 18 would be sufficient. With 32 in attendance, he decided to send 10 of us home right then and there. As the clerk opened her little, wooden, random-selection box, I began willing my name to be read. Wouldn’t it be just so cool to be the first name read off? I had a 1-in-32 chance of winning the worst lottery ever – a free trip back to work! My name was called for number 10. I can’t say I felt bad about being exiled from the courtroom, but I had been warming up to the idea of serving on the jury. Color me conflicted. Before we were allowed to leave, the judge had us sit for a few more minutes. He once again reminded us that we needed to continue to check in each evening and that our attendance today by no means released us from duty for the rest of the month. When the jury wranglers from upstairs indicated that they didn’t have anything further to add, he told us we could leave. The 10 of us got up and left the courtroom. Based on my seat’s proximity to the door, I was the third person out. I didn’t know if I was supposed to checkout somewhere, sign something, or what, but the guy in front of me was confidently striding out the door that led to the street. I followed, relishing the morning sunlight and somehow feeling free. I walked back to my car and then drove back to work. Not free, just a short reprieve. Back at the university our timesheets were due and I had to adjust mine for the 2 hours I missed for jury duty. Based on repeated bad experiences with the bureaucratic process, I fully expected to take possession of the shaft. But, lo and behold, it turns out that the University of Alaska offers to pay us our full salary for jury duty – all I need to do is turn in the $5 check from State of Alaska when it eventually arrives in the mail. How cool is that? I think it’s the first time that one of the budget regulations actually benefited me over the institution! Maybe jury duty isn’t so bad after all. Arlo, I’m very disappointed that you don’t vote. I can see why you might not for the presidential elections, but not even in city/state elections? I had jury duty down here – there were about 100 of us; we sat around for about 4 hours till they told us to go home, thus discharging our civic duty for at least a year. I hope. Yes, youll get $25 for a full day of jury duty up here. But youll get less if the trial only lasts a half-day, or in my case, only $5 if you attend but are not selected. As for not voting, it basically comes down to not caring. Ive never been interested in politics and, to tell the truth, havent seen how my life has changed dependant on who is in office  local, state, or federal. I know that it astounds some people that I dont care for something thats so important to them, but I have just never been able to get worked up over the political process. It amazes me that some people get SO MAD over politics and even go so far as to lose friends because theyre on opposite sides of the fence. In my opinion, its not worth it. you can console yourself with the fact that its one less vote against your side.